A new robot arm has been created by eLab Peers which has been designed to offer an affordable, easy to assemble design that is suited to both newbies and veterans of robotics. 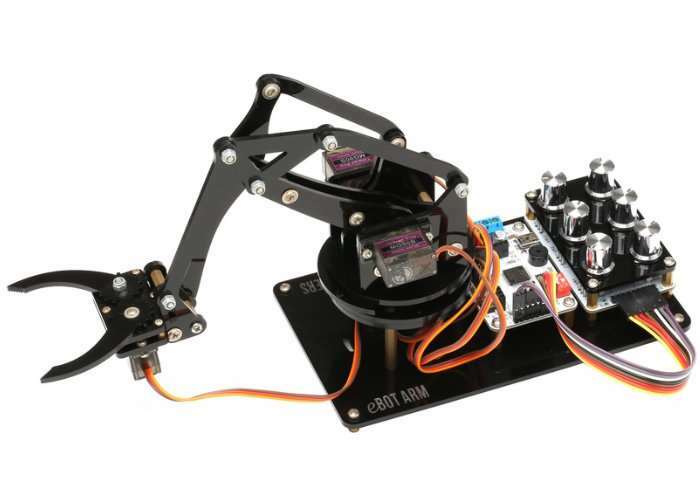 The robotic arm is available in a number of different kit providing different components depending on your requirements. Such as Bluetooth connectivity, servo controller boards and even eLab Peers Einsboard. We want to create a robot arm which is low-cost, easy to assemble and suitable for both newbies and veteran. It is also a great tool for learning robotics, electronics and programming in interesting way. After years of design, testing and improvement, we created eBOT ARM and start fund-raThisising in Kickstarter NOW.